I know a lot of people have these nostalgic feelings for the Teenage Mutant Ninja Turtles. I mean, the show itself has gone through different iterations throughout the years. From the original black-and-white comic, the 80s and 90s hit Saturday Morning Cartoon, the live action movies from the 90s, the rebooted animated series during the early 2000s and the current cartoon series on Nickelodeon. I’m assuming there are a ton of fans of the “heroes in a half shell” since they’ve been on-air for more than 3 decades! I’m not one of them. In fact, I’ve never watched any of the cartoons nor the old films. My only “real” experience with the brand comes from the PSN game Teenage Mutant Ninja Turtles: Turtles In Time Re-shelled. As if Teenage Mutant Ninja Turtles wasn’t a long enough name! Anyway, the game is my only basis for everything I know about TMNT. So when they released the new 2014 film, I didn’t know what to expect. I know there are a lot of fans and they’re up in arms regarding the film and how it doesn’t capture the feel of… whatever version of the Turtles they fell in love with. But what about me? What about a girl who has practically no knowledge about the show? Will I love it? Well, the only way to find out is to watch it! By the way, this review will be SPOILER FREE so you don’t have to worry about me saying anything about the story or twists. All I’m going to do is discuss my thoughts on the film. On with the review! The basic plot of the film is… confusing. Basically, there’s a group known as the Foot Clan and they’ve been terrorizing New York and the police are unable to handle the situation. While investigating the Foot, reporter April O’Neil catches glimpses of a mysterious vigilante who was actually successful in stopping a Foot Clan robbery. She investigates and finds that the vigilante is actually the Teenage Mutant Ninja Turtles. While my summary may make it seem the story is really straightforward, it isn’t. There are lots of weird side stories that makes the overall film disjointed. Since I can’t really give any spoilers, let’s just say the connection between the Turtles, April and the villains is extremely coincidental. A movie about mutated adolescent amphibians with ninjitsu skills needn’t be this complex! When I first saw the trailer, I thought I was going to hate the Turtles look. At first glance, they are freakish looking and just flat out unappealing. And they are! Then again, the Turtles were my favorite part of the film. It’s easy to distinguish between them. I remember while playing the game I had difficulty remembering which Turtle I was controlling since they all looked alike. Not so with the movie. Each of the Turtles have unique features, making it easy to know who’s who. 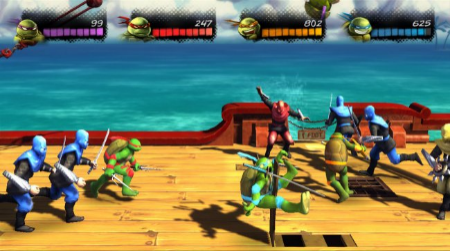 The film lets each of the Turtles’ personalities to shine through. Leonardo is the leader and tries to make rational decisions even during a heated battle. Donatello is the one with all the gadgets and is the tech savant of the group. Raphael is the huge bruiser of the quintet and pretty much towers over the others. And Michelangelo is the slacker and fun loving Turtle. See? Even just by watching the movie, I could tell which is which! But the best thing about the Turtles is their interaction between the four of them! Even if they all have different personalities, they still get along really well. It’s this feeling of family bonding that keeps them together and it really shows in the film. I actually wish they were in the film longer since, like Transformers (another Michael Bay produced film), they put too much focus on the human characters. Megan Fox was actually okay as April O’Neil thankfully since she takes up most of the screen time. But the movie just seems to slow down whenever she’s on screen! I didn’t like the acting of the rest of the cast. I liked Will Arnett in The Lego Movie and Up All Night but he was just not funny here. And I think the guy who plays Eric Sacks was so wooden, I could see mushrooms growing from his sides! I don’t know if that metaphor makes any sense but it’s the best I could come up with. 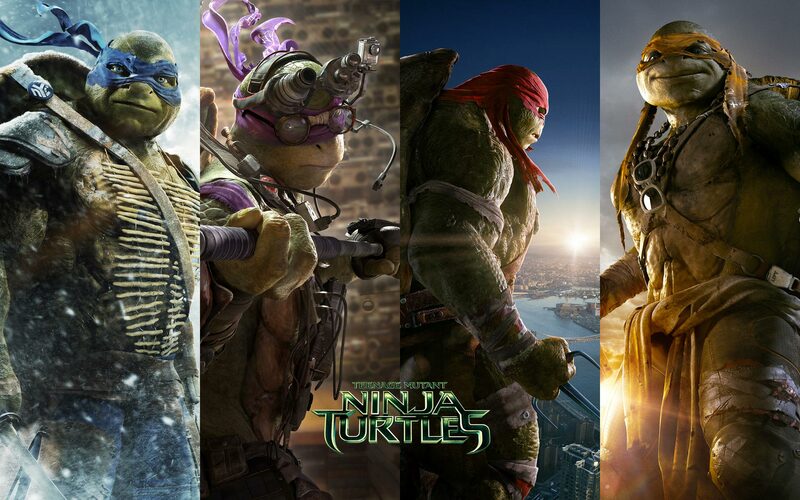 The action sequences are mostly good… and the good ones are the ones with the Turtles! The scene where they’re taking out Hummers down a snowy mountain was exciting and was very unique! And the final battle was pretty exciting (if a bit anti-climactic because of how they won the battle). But the action sequences involving only the human were boring! Yet, they always need to have April O’Neil “save the day.” It’s a movie about Turtles! Let the Turtles win the battles and not have some human step in! Even though I enjoyed Turtles action from the movie, it does show a problem with the actual design of the characters: they’re too big! It’s hard to make them seem like underdogs when they’re huge, nigh-indestructible creatures! Which is probably why they made Shredder wear this power armor thing with projectile blades and stuff. It just looks too over the top! While it makes it plausible why an ordinary (non-mutated) person can take on mutated turtles by himself, it didn’t have to be if the Turtles were smaller and more vulnerable. So, bottom line time: Did I enjoy the latest Teenage Mutant Ninja Turtles film? Honestly, I did. Whenever the film showed the Turtles on screen, the film is a delight! Is it a good movie? Not by a longshot! There are too many bad parts in the film and convoluted plot points that are just plain dumb. I can consider it as a “guilty pleasure” movie. A movie that I know is bad but I still enjoy watching. I guess the most important thing is it did make me interested in knowing more about the Heroes In A Half Shell. You know what I have queued up on YouTube? The original live action film! Yes, this film convinced me to check out more Turtles media. If that’s what it set out to do, then it did a good job. What did you think about the new Teenage Mutant Ninja Turtles movie? Leave your opinions on the film in the comments section below!